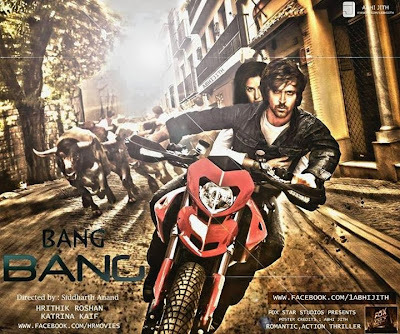 Bang Bang is the next movie of Hrithik and Katrina.Lastly both are seen in Zindagi NaMilegi Dobara and this is the hit movie on this time.People Liked very much both chemestry ,they are look in movie very cute . Bang Bang is an upcoming Hindi action thriller movie. Which is directed by Siddharth Raj Anand .Hirithik and Katrina are in lead role in this movie.This movie is remake of remake of the Tom Cruise,Cameron Diaz staring movie Knight and Day.It is the desi version of knight and Day Movie.This Movie is released on October 2, 2014.